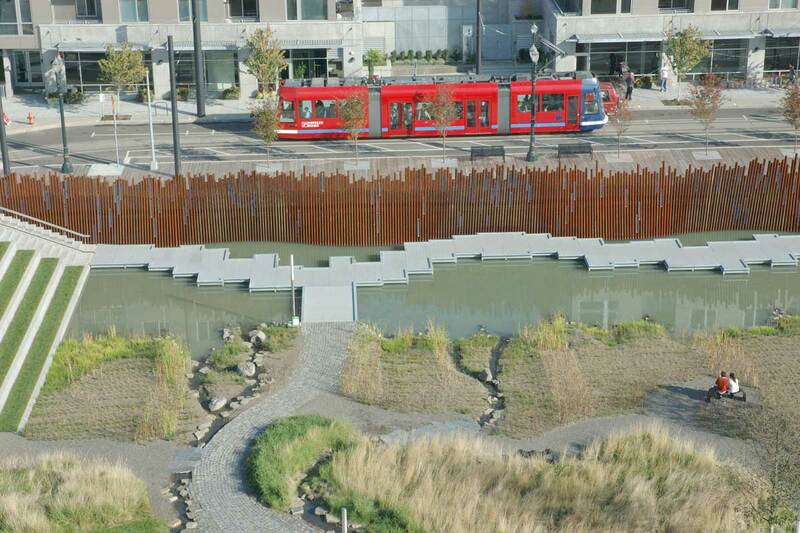 Beginning with the daylighting of Tanner Creek in Portland (1992), we’ve been collaborating with urban planners and landscape architects to restore urban streams in the US and abroad. 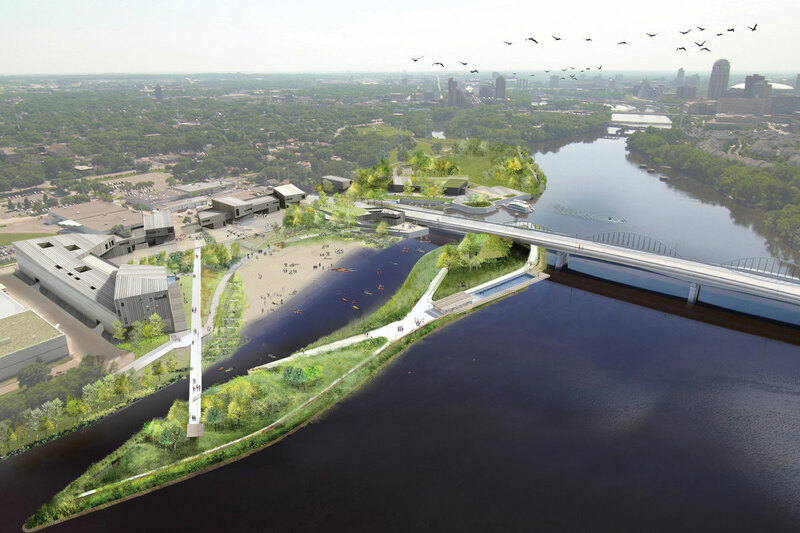 We worked with a multi-disciplined collaborative design team led by Tom Leader Studio and Kennedy & Violich Architecture on design input, as well as review of concept ideas, for this award-winning Minneapolis riverfront renewal project. 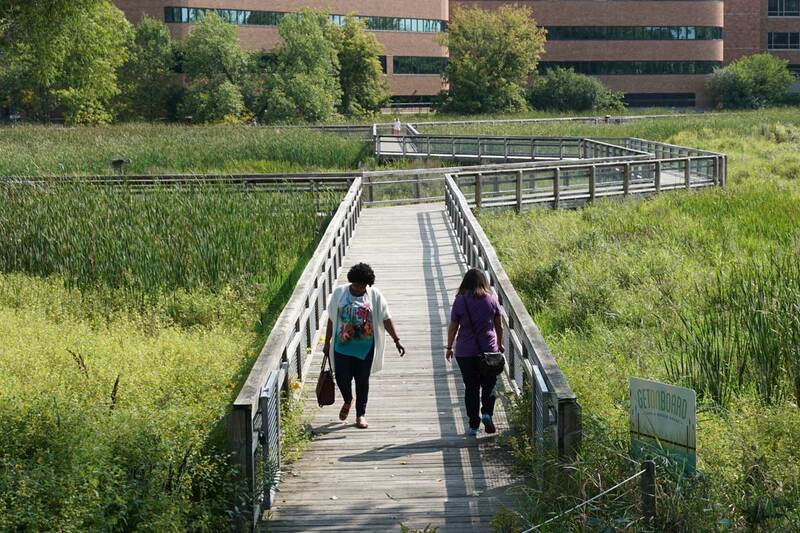 The team assisted developing riparian wetland design concepts, incorporating stormwater filtration and public access in areas intended for park expansion. Inter-Fluve also reviewed hydraulics for the reach, assuring that design concepts fit within the hydraulic and hydrologic regime of the design reach. Photo: TLS Landscape Architecture. 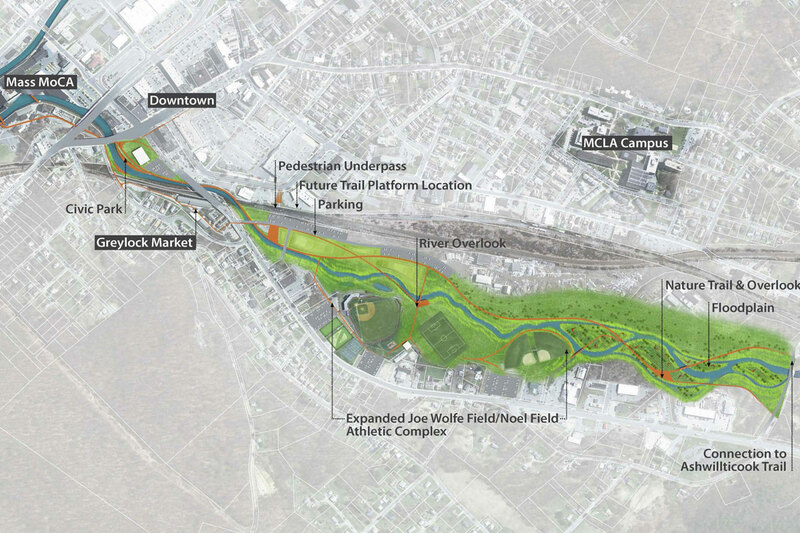 Inter-Fluve and Sasaki Associates developed conceptual and preliminary designs for the restoration and reconnection of the South Branch Hoosic River. 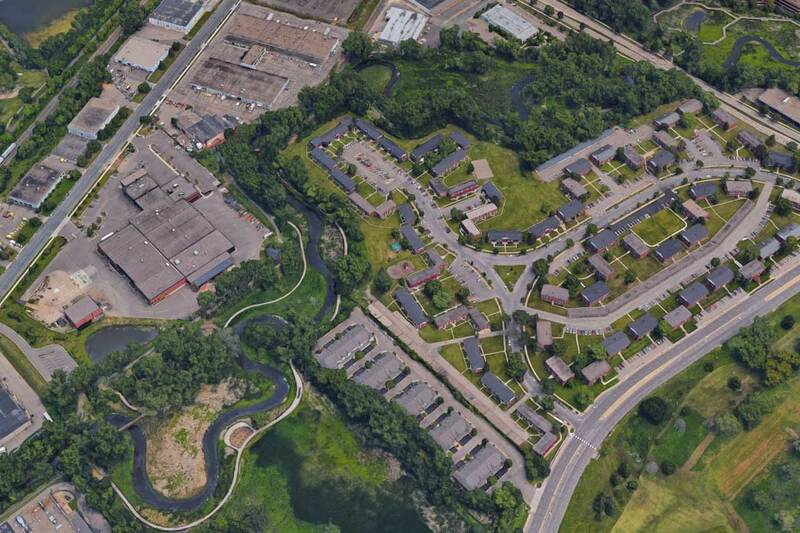 This project will reconnect people to the Hoosic River, identify opportunities for riverfront redevelopment, connect different parts of the city, create economic development and restore some of the functionality of a river ecosystem without compromising the chute’s current flood capacity. Photo: Sasaki. 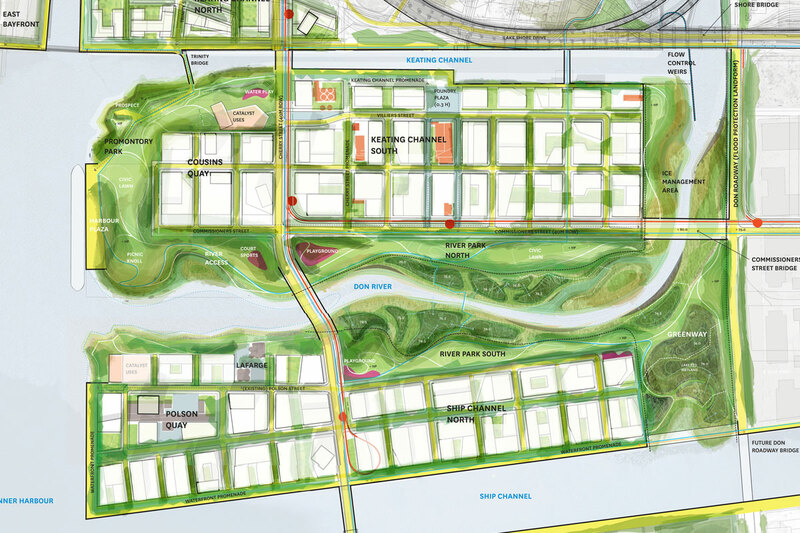 Inter-Fluve was contracted by Michael Van Valkenburgh Associates (MVVA) and Waterfront Toronto to assist with the $1 billion Don River revitalization project.The 308-acre Lower Don Lands area has a long history of industrial use, manipulation of the Don River, and consequently flooding. Photo: MVVA. 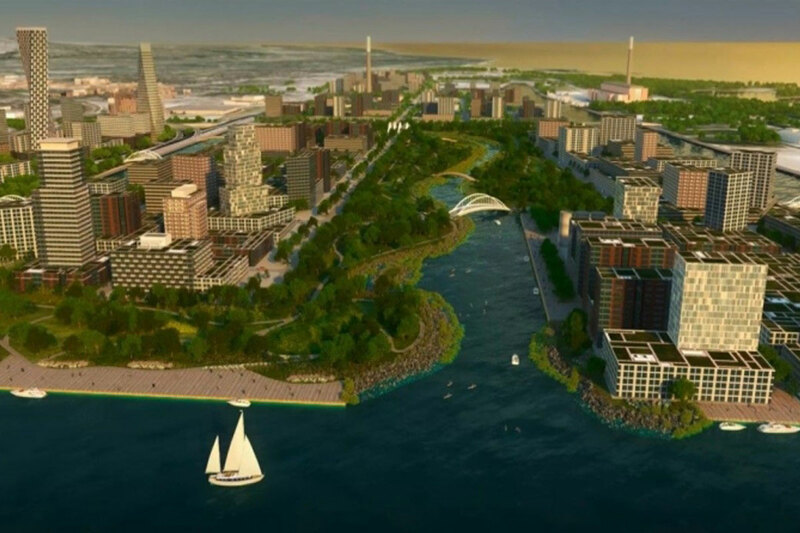 The plans would see the Don River’s mouth re-routed from its current location at the Keating Channel through the middle of the Lower Don Lands between the Keating Channel and the Ship Channel restoring it as a major feature of Toronto’s waterfront and the centerpiece of new mixed-use neighborhoods and parks and green spaces. The changes also provide the flood protection necessary to enable development of the immediate area and the larger Port Lands. Photo: MVVA. 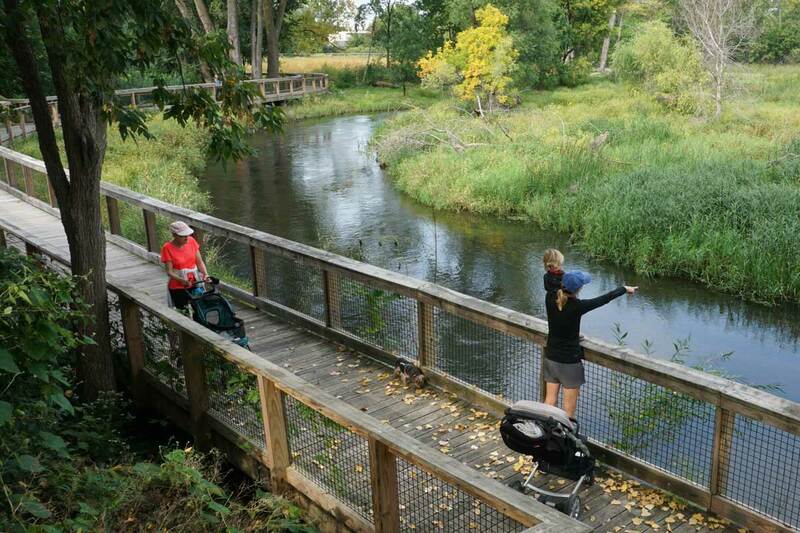 Beginning in the 1940s, Minnehaha Creek was dredged and straightened, which increased erosion, and degraded fish and wildlife habitat and water quality. Inter-Fluve performed a 22-mile reach assessment of the creek in 2003 for the Minnehaha Creek Watershed District. 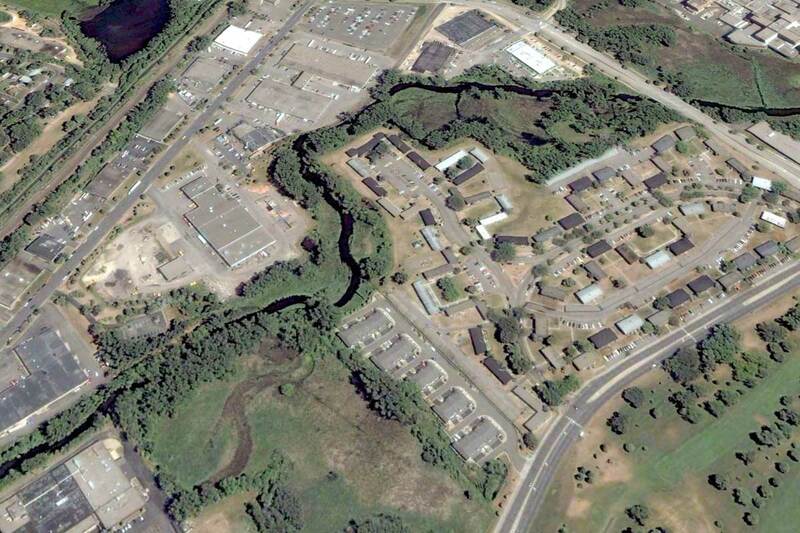 Photo: Google Earth 2006, before construction. Over the last fifteen years, Inter-Fluve has worked with the Minnehaha Creek Watershed District and others to complete the highest priority projects that include bank stabilization, in-stream habitat, and riparian restoration plans, natural channel restoration, fish passage barrier removal, recreation access, infiltration design, road closure, wetland restoration and boardwalk construction. Photo: Google Earth, 2017 of Reach 20 (bottom of image) and Methodist Hospital (top of image). Boardwalks like this one at Reach 20 connect people to the river. Future trails will connect the regional trail with the proposed Light Rail Transit stations in St. Louis Park. The boardwalks are are frequently used by both hospital staff and patients. Tanner Creek originates near downtown Portland, flowing through a pipe under the city, and gathering stormwater from a major portion of downtown. In 1992, the City of Portland’s Bureau of Environmental Services contracted with Inter-Fluve and other consultants to develop alternatives for removing sanitary sewer flows from the stormwater pipeline. Photo: GreenWork PC. The project received a 1994 Honor and Sustainability Award from the Oregon Chapter of the American Society of Landscape Architects. Photo: GreenWorks PC. 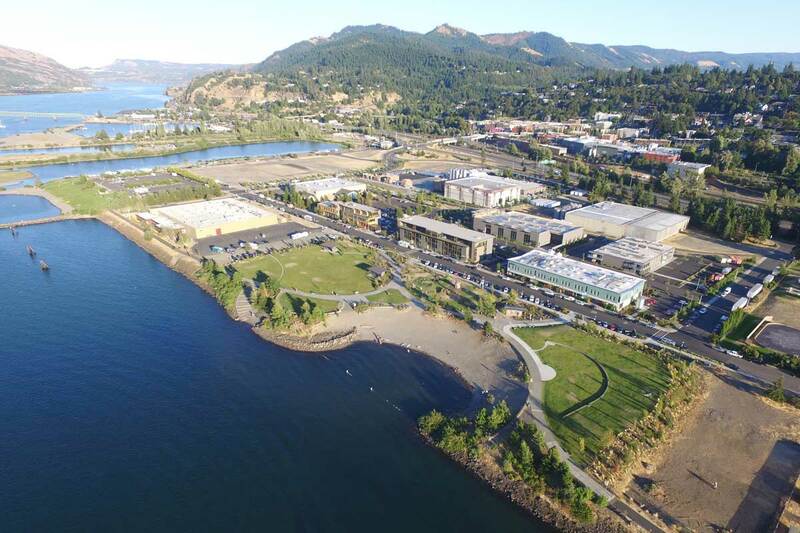 Inter Fluve was the sub-consultant to provide design development and environmental permitting service for the Hood River Waterfront Park (it’s also the front yard of our office). Photo: GreenWorks PC. 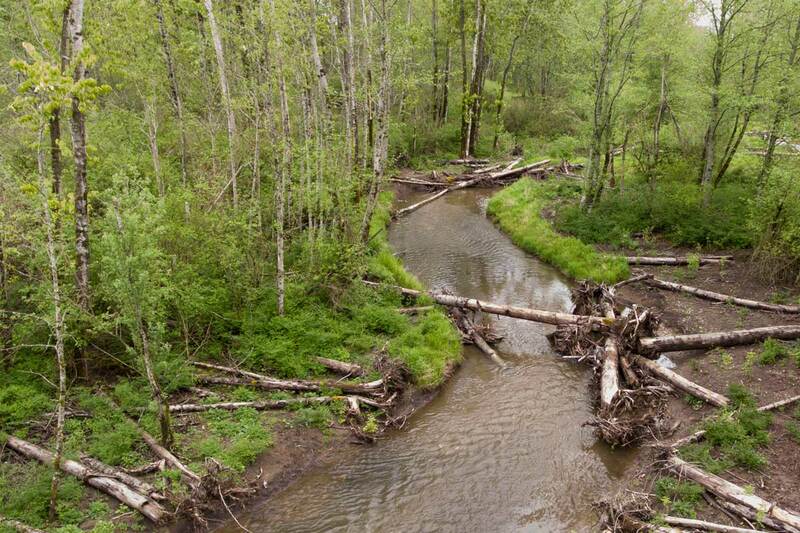 Urban runoff, forestry, agriculture, and construction of Intersate-5 have degraded conditions of Squallicum Creek enough to be listed as impaired for several water quality parameters. 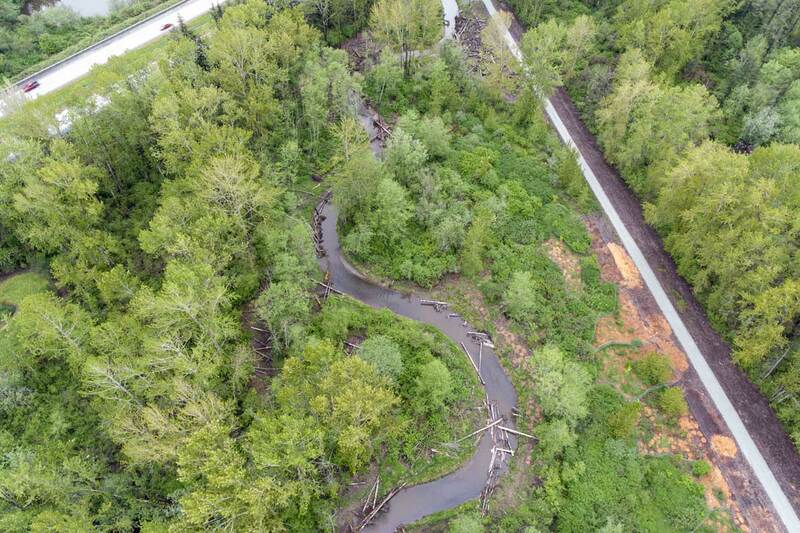 Inter-Fluve worked with the City, other stakeholders, and consultants on the Squalicum Creek Re-Route plan to improve water quality, flood conveyance, and salmonid habitat. The new channel flows along a natural meandering planform with pools and riffles, and wood adjacent a floodplain that supports riparian forest and wetland. 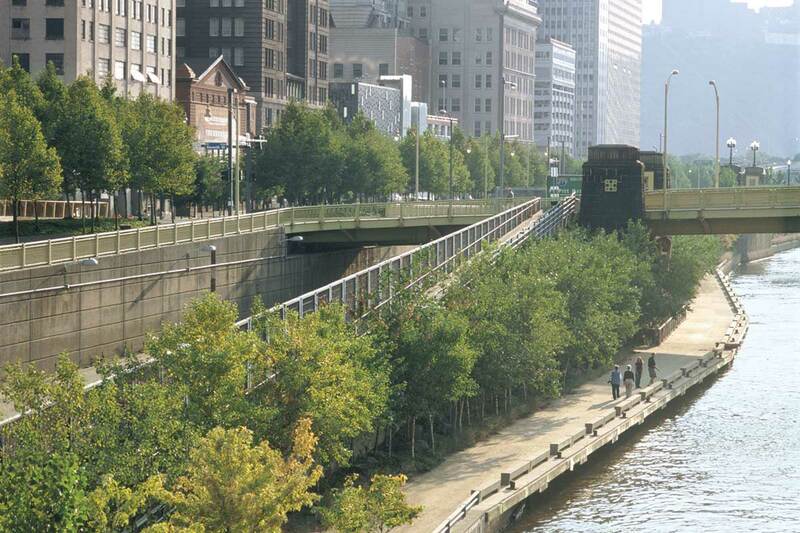 The restored channel flows along a walking path (right), and interstate (left). 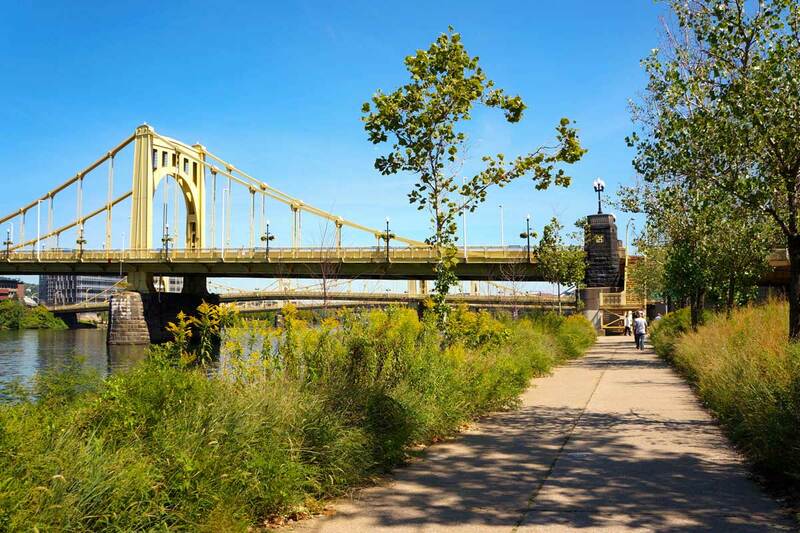 Inter-Fluve conducted analysis of site hydrology and hydraulics for design of the $11M riverfront park along the Allegheny River. This analysis was used to guide design of civil infrastructure, and to establish the design criteria for bioengineered river bank revetments. 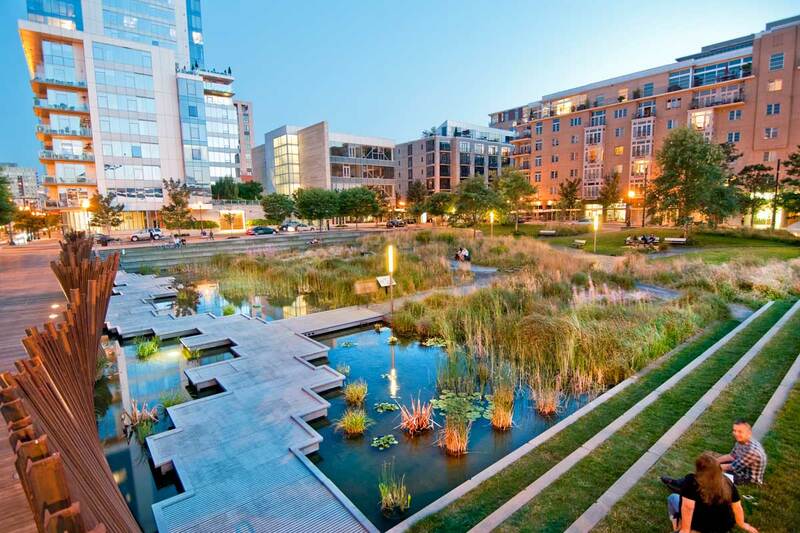 Photo: Michael Van Valkenburgh Associates, Inc.
Our design and analysis was integrated with a team composed of international civil engineering groups and the nationally renowned landscape architecture firm Michael Van Valkenburgh Associates. The bioengineered terrace was designed to withstand inundation at 335,000 cfs. 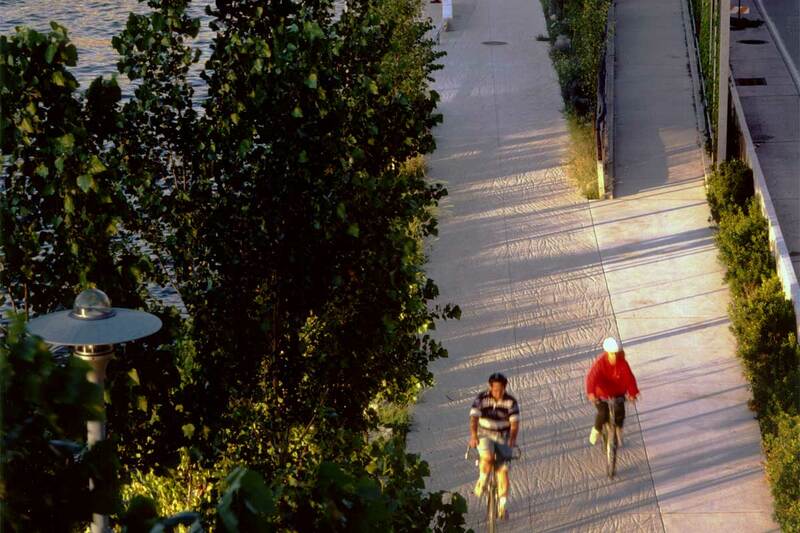 Today, the Riverfront Park is a popular urban destination for running, biking, kayaking, paddle boarding and canoeing. 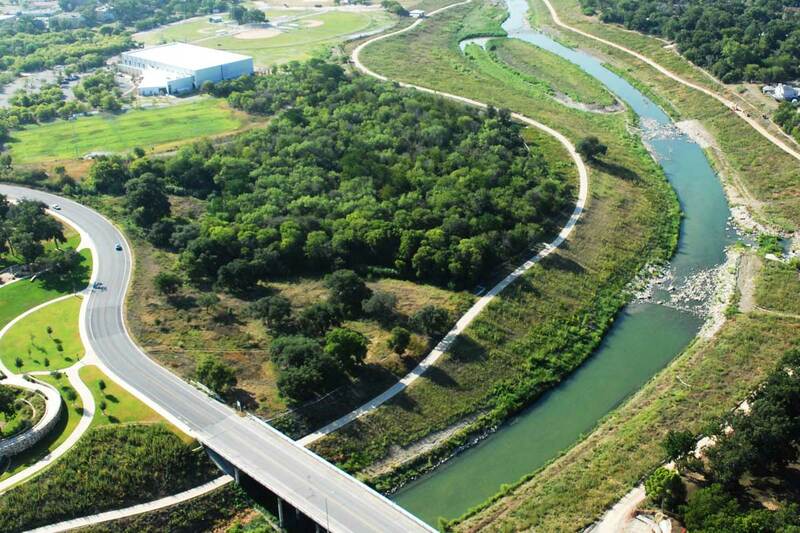 Photo: Michael Van Valkenburgh Associates, Inc.
Until it was restored in 2014, San Antonio’s nine-mile Mission Reach flowed through an undeveloped flood control ditch south of downtown San Antonio. Photo: J & L Consulting. 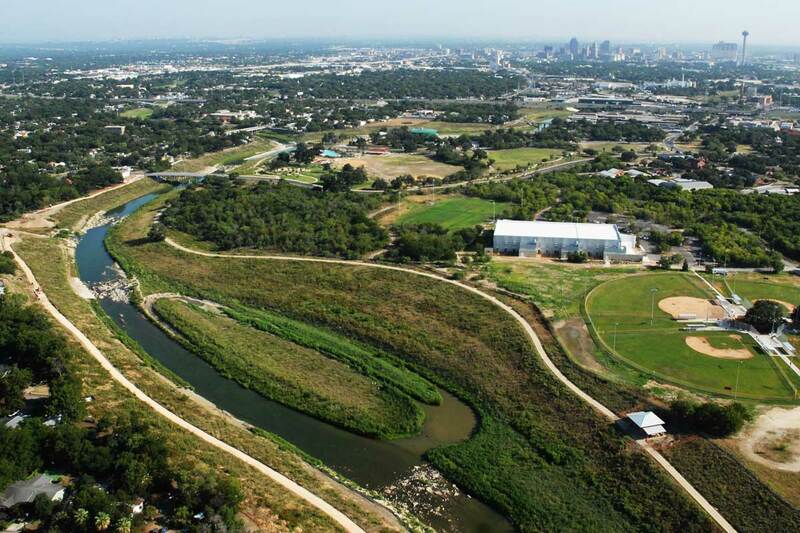 The goal of this project was to transform this flood conveyance channel into a more natural river and greenway system that does not compromise the flood control benefit. Inter-Fluve participated in creating preliminary designs and cost estimates. Photo: J & L Consulting.